Upcoming Events at SIREN. 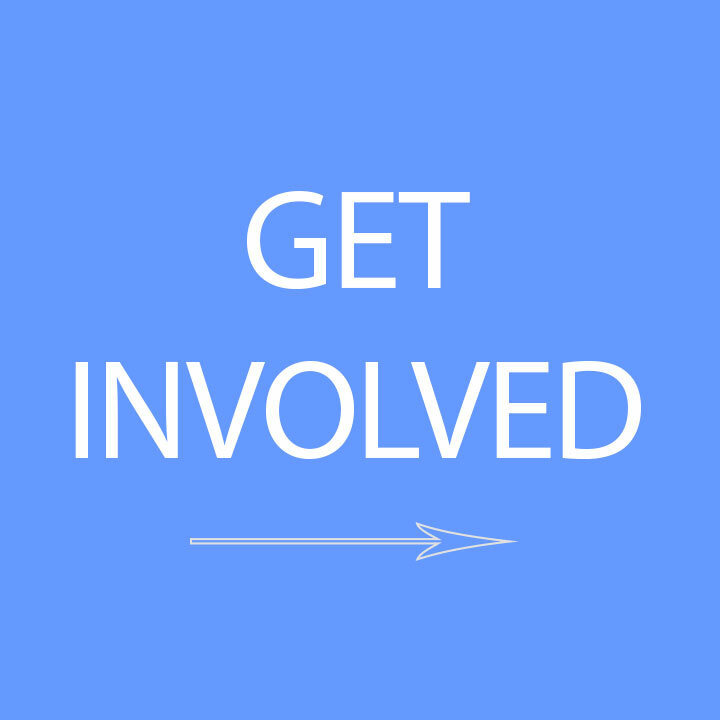 Our mission is to empower low-income immigrants and refugees in Santa Clara County through community education and organizing, leadership development, policy advocacy and naturalization services. We believe that all people regardless of legal status or nationality are entitled to essential services, human dignity, basic rights and protections, and access to full participation in society. -Ofrecemos becas para cubrir la tarifa de renovación $495 Por favor traiga sus impuestos más recientes ó 3 talones de cheques para calificar. -Certified court disposition of all arrests, criminal record, or deportation orders. -Scholarships available for those who qualify. Please bring your most recent tax return or three pay stubs to qualify. SIREN provides eligibility consultations, application assistance, and legal review of completed forms. SIREN’s mission is to empower low-income immigrants and refugees in Santa Clara County through community education and organizing, leadership development, policy advocacy and naturalization services. We believe that all people regardless of legal status or nationality are entitled to essential services, human dignity, basic rights and protections, and access to full participation in society. As we fight for immigrant and refugee rights, we ask you to consider making a donation or becoming a monthly donor. Your support will directly support free legal services, advocacy work for more just laws, and leadership training for community leaders. Every Wednesday  in the Bay Area Office 9:00am - 4:00pm. No appointment is necessary. 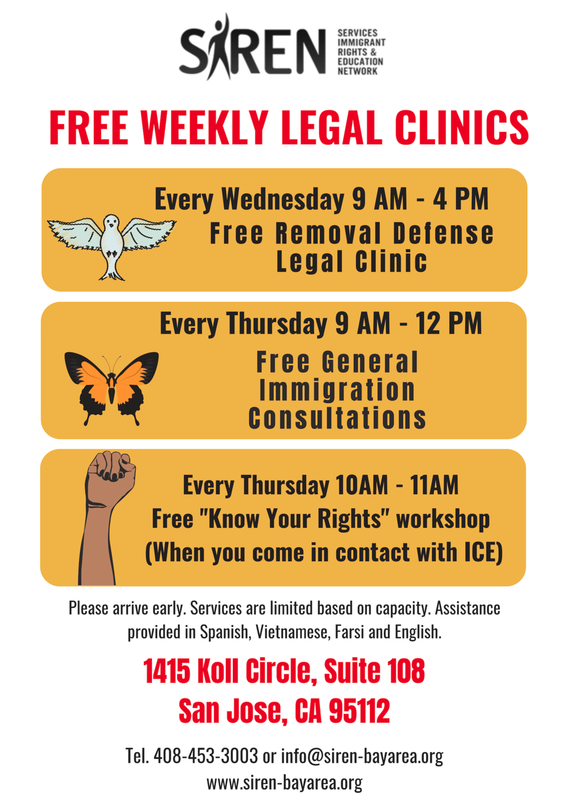 Every Thursday from 10:00 a.m. to 11:00 a.m.  in the Bay Area Office. No appointment is necessary. 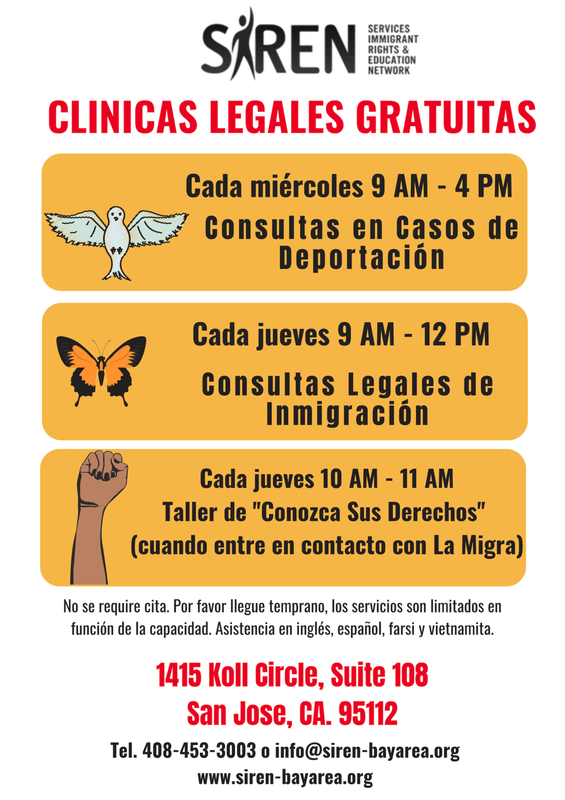 Free walk-in legal consultations every Thursday 9:00am - 12:00pm in the Bay Area Office. Consulatas legales gratuitas cada jueves, 9:00am - 12:00pm en la oficina de San Jose. 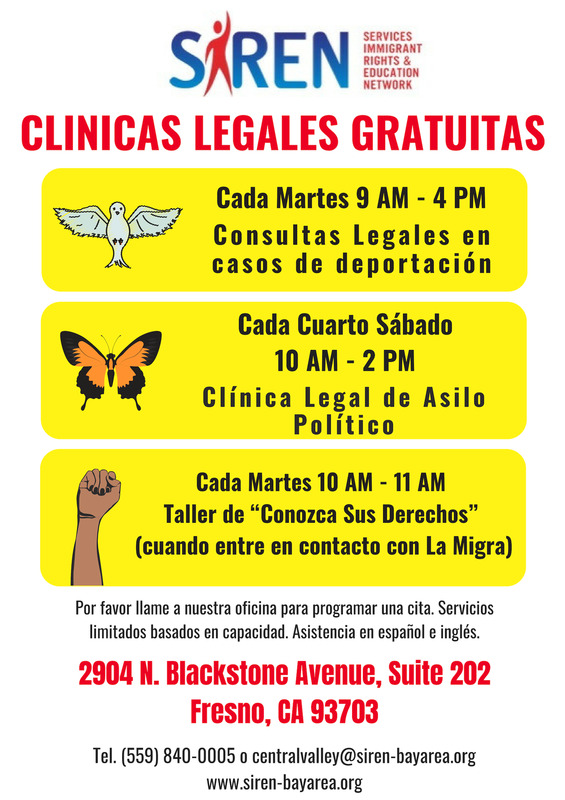 Monthly Asylum Clinics at our Central Valley office 10-2pm. For more information please email: centralvalley@siren-bayarea.org or call (559) 840-0005. 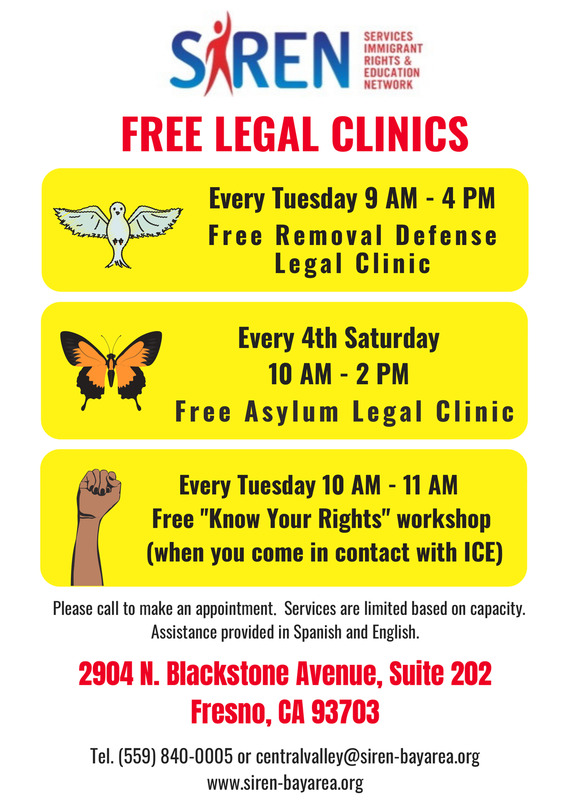 Call our free immigrant question and answer hotline to receive legal information and referrals to low cost community resources. llame a nuestra línea gratuita de preguntas y respuestas para inmigrantes para recibir información legal y referencias a recursos comunitarios de bajo costo. Sign Up & Stay Connected for the latest information on public benefits, citizenship, and immigration.